HOUSTON - A trace of snow in Houston on Tuesday broke a record that has stood since 1979 as freezing temperatures begin to overtake the region. According to the National Weather Service, the flurries observed at Bush Intercontinental Airport on Tuesday broke the record for earliest observed snow in Houston. The previous record was set on Nov. 23, 1979. From San Antonio to Huntsville to Corpus Christi, people reported all types of wintry weather. Several KPRC2 viewers shared videos of flurries and sleet. Some people even reported graupel, which is basically a snowflake that has frozen drops of water around it. Temperatures will hold in the upper 30s to low 40s for the rest of this afternoon, with the gusty winds it will feel like the 30s. Skies will clear tonight and as winds relax conditions will be prime for a very cold night Tuesday night into Wednesday morning. A freeze warning is in effect from Tuesday evening through Wednesday morning, meaning sub-freezing temperatures are possible for the area as winds die down. Stapleton said wrapping your pipes shouldn't be necessary, but delicate plants might be at risk and people may want to wrap them. It is also important to remember to bring outdoor pets in or provide a warm shelter, dress in layers and to practice fire safety if you are starting up the chimney for the first time this winter. KPRC2 reporter Sophia Beausoleil shared some important fire safety tips including when to get your HVAC system checked, where to plug in space heaters to prevent fires and making sure your smoke and carbon monoxide detectors work. The average first freeze at Bush Airport is Dec. 3. Although the freezing start for Wednesday morning is ahead of schedule, it is not record-breaking. 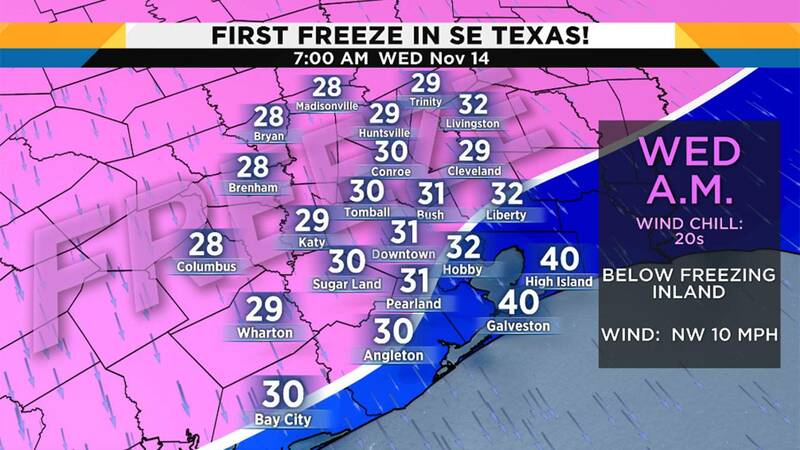 The earliest freeze on record for Houston was on Oct. 20, 1989. Temperatures are expected to go back up to the 60s by the end of the week.